Pacer Christian Cullen edges out Iraklis to win the DB Draught New Zealand Trotting Cup at Addington in 1998. Named after the famous All Black, Christian Cullen was first a champion pacer and then a top sire. He was trained by then part-owner Brian O'Meara and driven by Ricky May to win all his 12 starts as a four-year-old. 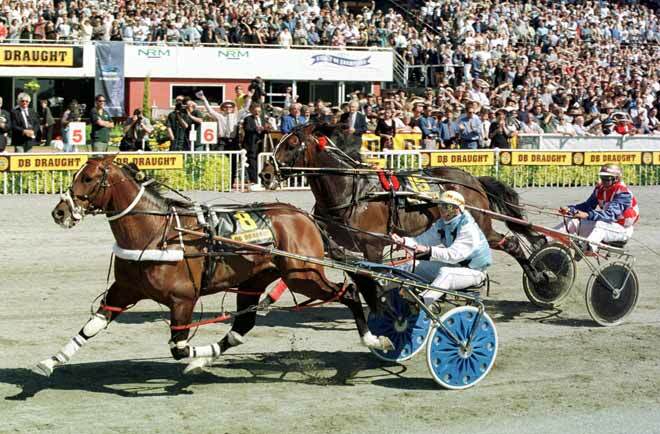 These included the New Zealand Cup in 1998, the New Zealand Free-for-all, the Auckland Cup and the Miracle Mile in Australia. That record made him both Horse of the Year and Pacer of the Year in 1999. In all, Christian Cullen won 22 of his 31 starts and over $1.2 million in prize money. Retired to stud in Christchurch in 2000, he became a leading sire, heading the premiership three times. In 2009 he spent a year at an American stud, but this coincided with the international economic decline, and he was returned home to Wai Eyre Farm. One of the country's top stallions, he helped change negative attitudes to New Zealand-bred sires.